Andrew will release a new CD next year, featuring ethnic samples from Asian, African and European countries. Edge first met Austrian-born Judy (Josef) Klausner when he moved to Austria. They worked sporadically together in various formats, until deciding to record a CD that would feature purely percussion instruments and vocals. Klausner then recorded various South American rhythms at the CCP studio in Linz, with Claus Prellinger as engineer. Edge later composed songs over the basic tracks, with the added difficulty that all the melodies had to follow the tuning of the congas and percussion. Their first CD was released in 2011, simply entitled "Drumsing". Andrew thought his future was in Denia, Spain, and almost moved there in January 2009, but after the cash crisis, he decided to stay in Austria. He is now working at the HAK academy in Linz, as an English Conversation Trainer. Andrew played one gig with The Royal Drive Affair in Linz in early 2007, but the band disbanded the day after. You can watch the videos of "You wear your dresses too short" and "She's gotta have it" by clicking on the song title links. Andrew spent a few years writing songs with Thomas Mandel for a project called Mandeledge that would feature vocals, grand piano, double bass and drums. Wolfgang Bruendlinger later added guitar. Early in 2007 Mandel decided that he did not wish to continue and left the project. 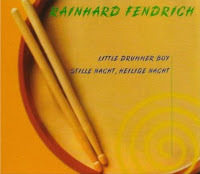 Andrew duetted with Rainhard Fendrich on Fendrich's Xmas single, Little Drummer Boy/Stille Nacht, Heilige Nacht: released Xmas 1997. Rainhard is famous as a singing star and actor in Austria and Germany, and asked Andrew to sing with him on a version of "Silent Night" which copied the original idea by only featuring two voices and an acoustic guitar. "I drove to Rainhard's house in Vienna to record the song and we practiced it in his studio. I learned how to sing it in German but with an Austrian Linz accent, and Rainhard said I sounded too foreign. (He wanted more of a Vienna accent...)"
Andrew Edge (BMG-Ariola records). First single - "Black River, White Moon" - released 29.4.96 Solo album "Northern Sky" CD - released summer 1996. Andrew Edge Voc/Gtr/Kybd, Gerald Landschützer Kybd/co-producer, Manfred Puchner Gtr., Kurt Mitterlehner Bass, Herbie Becker Bass, David Edge Percussive engineering. "I was asked by BMG to record some demos and BMG liked what they heard. We recorded it over 9 months in Gerald's front room, with me singing in the larder that was just large enough to fit a microphone stand in it." "Standing in the larder and trying to sing as loudly as I could. I always wondered what the next-door neighbours thought (they couldn't hear the music - just me endlessly singing the same song.)" 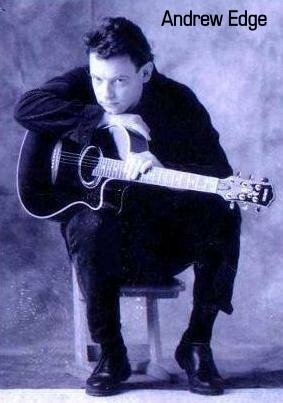 Andrew Edge (Solo I) Black Velvet Records Recordings with Robert Ponger-producer ( Falco-Paper Moon etc...) signed contracts with Black Velvet Records and with Warner Bros/BMG Ariola for publishing and record distribution. Supported Joan Baez in Vienna. "I had just unceremoniously parted company from YOYO and I was wondering what to do. Robert Ponger called me and asked if I was interested in working with him - I was. He had just had a recent success with the Paper Moon duo and he was setting up his own record company. I went to his studio outside Vienna and we talked. We later recorded the first song which was 'Northern Sky'." "For the next 3 years I went to Vienna every now and again. We recorded about 12 songs in 3 years = 4 songs a year = 1 song every 3 months. Eventually I just got so frustrated waiting for Robert to call that I stopped it. Robert signed me over to BMG for an undisclosed sum." "Sitting in the garden of Robert's studio. He would play me a tune and then send me off outside to quickly come up with the lyrics. The lyrics to 'Northern Sky' were written because I had seen a report about the ozone layer the previous night. 'There's a hole in the sky, it's a hundred miles wide, and the colours are fading.' I remember thinking about the McCartney song at the time: 'I'm fixing a hole where the rain gets in, to stop my mind from wandering'." YOYO (EMI Records) Andrew Edge Voc/Gtr. Christoph Raffetseder Gtr/Voc. Andreas Raffetseder Bass/Voc. Manfred Cellnig Gtr. Hansi Riener Drums. 1 album and 3 singles released singles: Day after Day - Games People Play - Get Up. "I formed YOYO after having lived in Austria for a year. I stole Andreas and Christoph from a band called 'The Jay Band', and Hansi and Manfred from 'High & Mighty'. I wanted it to be a guitar-based pop band with harmonies; a classic/American west coast type of thing. After a year we signed to EMI. I said that if a band don't get signed after a year they should give up. We recorded the Album/CD in Vienna in the middle of summer. The only problem was the air conditioning couldn't be turned on while we were working. Hot and sticky." Although I totally disagreed, the boys insisted on signing a management agreement with an advertising agent and a serving 'Cobra' policeman (Counter-Terrorism Special Operations tactical unit), who agreed to a tour supporting the ÖVP (conservative Austrian People's Party). I disagreed with this as well, so they got rid of me (by telegram) and found another singer to do the tour." EMI later dropped them and they made one independent EP.....then disbanded. Some good memories and a few bad ones. I still miss the 3-part harmonies and the chiming guitars." Played concerts in Austria. Tour of Italy. Peter Androsch has gone on to be a successful classical music/opera composer in Austria. Robert Spour has composed and performed for two 'Klangwolke/Sound Cloud' installations in Linz. Wagner and Beat-Hoven: Andrew Edge Voc/Gtr/Snare drum. Gotthard Wagner Violin (Urfahraner Aufgeiger) "We played a completely random set of songs/musical 'pieces' and improvised collages." 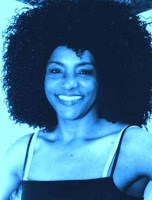 Etta Scollo: Andrew and the Raffetseder brothers (from YoYo) sang backing vocals on her album "Io Vivrò". 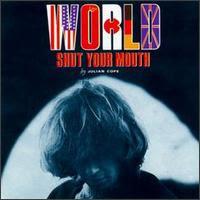 Julian Cope - World Shut Your Mouth album/1 track. "Savage Progress was recording its first demos at The Point Studio in Victoria, London. Julian had booked a few weeks to record his 'World Shut Your Mouth' album. The song 'World Shut Your Mouth' came later on Julian's next album. His drummer (ex-Teardrop Explodes drummer) had gone back to Liverpool. Alex Burak was engineering the album and he and I were good friends, so he phoned me up to ask if I would play on the last track. Savage Progress had been in there 2 nights before - Ned opened the door to the Control Room and had knocked Julian's 12-string guitar over - the neck of the guitar broke in two. If you read the lyrics of the album it contains lines that refer to the accident. (Alex Burak doesn’t believe me about this.) I charged Julian the standard Musicians Union rate at the time. It took his management company a whole year to pay it." Nicky Tesco (The Members-Leningrad Cowboys) studio recording and live concerts. Thomas Lear - 1 album track. The Chills (New Zealand) played drums on "Pink Frost" - recorded at The Point studio, London. Stump (London) concerts in and around London. Died Pretty (Australia) Tour of Great Britain and France. Hipsway - 1 single ('The Honey Thief'). After having lived in London for some years Andrew moved to Linz in Austria. He started his singing/songwriting career as well as continuing to play drums occasionally. Savage Progress (Ten records/Virgin Records) Glynnis Voc. Rik Kenton Bass (Roxy Music) 'Ned' Perc. Carol Isaacs Kybd. (see Viva Lula) Andrew Edge Drums/Perc/Voc. Toured Great Britain with The Thompson Twins in 1984, toured Austria, Germany and Switzerland and played numerous club gigs in England. "I was 'stolen' from Viva Lula by Savage Progress. At least, I like to think that. Savage Progress had only worked with a drum machine before I joined. This was the era of a multi-cultural, ethnic 'World Music' bands and performers. We were definitely multi-cultural. Glynnis was African/English - 'Ned' was Asian/English - Carol was Jewish/English and Rik and myself were.........well, we were from Nottingham and Leeds." "Standing in a 'Kentucky Fried Chicken' after the first rehearsal. Rik: 'So, Andrew, I heard you used to play with The Thompson Twins.' Andrew: 'Yes - who have you played with?' Rik: 'Roxy Music.....could you add a portion of chips to that order, please?' My jaw dropped to the shop floor. I remembered hearing 'Virginia Plain' by Roxy Music when I was still living at home and dreaming of being in a band. I had met my first boyhood hero - in a shop selling fried chicken. Rik told me he once played in a Working Men's Club in Nottingham when he was just starting out. Whilst the band were playing somebody announced loudly over the Intercom: 'The pie and peas have arrived!'. Everybody left within 30 seconds. The band played on to an empty room. Supporting the Thompson Twins at the Hammersmith Odeon. It was a holy temple of music to me. Everybody had played there. We played 5 nights. It felt like clocking on for work. The tour of Europe. Being made to feel totally welcome everywhere we went. Going into the back of the camper and crying to myself everyday because the emotional strain was overwhelming; Christmas/Birthday/drunk/ego-surges/happy/bored/excited - every single day - every hour - for a month. John Lennon: "It's all too much, for me to take." Seeing my face on a 'K-Tel - Hits of 1984' album cover. Stardom at last. Being lost in the middle of some German town and forgetting which hotel I was staying at." Viva Lula (Arista Records) David Lloyd Voc/Acc. Gtr. Chester Kamen Gtr. (Bryan Ferry-Nick Kamen-Jimmy Nail-Natalie Imbruglia) Allan Dias Bass (PIL) Carol Isaacs Kybd (Midge Ure-Sam Brown-Sinead O'connor) Andrew Edge Drums/Perc.Voc. Toured with Big Country for 2 weeks in Great Britain - Concert in London with John Cale as support group. Played a six-week headline tour of east coast America - three singles released. The Thompson Twins: Tom Bailey Bass/Voc. Pete Dodd Gtr/Voc. John Roog Gtr. Andrew Edge/Drums (photo shows Chris Bell) Eight months of concerts in and around London. 1 demo cassette produced (for record companies only). "I auditioned for The Thompson Twins in a studio called The Point, in Victoria, London. They were pushing tempos to the limits of a drummer’s physical endurance. (This was before Techno and 185-190-210 beats per minute.) I got the job because I could play all their 'fills' (the musical breaks between singing). They couldn't understand how I knew what was coming. I didn't tell them that they used the same 'fill' every single time. It was always the 'Bossa Nova' beat. I left the band twice. Why? Internal politics; "Too many Chiefs and not enough Indians". They released one single which was recorded live at the 101 club in Clapham, but credited the drummer as Chris Bell. Tom later sacked the band, took the name and created the version that became massively sucessful." Boys Will Be Boys Fanni Firmin Voc/Gtr. Mark Wan Gtr. Clare Hurst Sax (Belle Stars-David Bowie) Sara Lee Bass (Gang of Four-B52s) Andrew Edge Drums/Voc. 1 single - self produced. "Fanni's real name was/is Fanni Firmin. She used to get looks from people who couldn't believe it wasn't her stage name. I was always asked if ´Edge´ was my real name. Mark's name was a joke based on 'Mach-One'. He used to laugh a lot about it. Clare and Sara only played with band for short periods of time." "We used to rehearse in airless, sweaty holes in the backs of pubs or in a tram shed down by the docks. We played the usual London gigs at the time: The Greyhound in Fulham, Dingwalls in Camden & The Rock Garden in Covent Garden. This was the era of Pub-Rock, Ska, Punk and anything else you could think of." "Rich Saunders and myself spent a fairly short time in an extremely small practice room at secondary school. We had no idea what to hit, or how, we just whisked drumsticks across the cymbals and tapped the drums. We left when the air ran out (I said it was a small room.) We realised that we'd been in there for something like 2 or 3 hours. Anything that could make me forget where I was for that length of time had to be worth looking into." Edge started playing drums at the age of 15, working with musicians from the Leeds College of Music, and playing drums at the East Leeds Working Mens' Club (now called the Seacroft Green Social Club) at weekends for £19 a week. Drum Lessons: "Geoff Myers; the professional. Doug King; the genius, who taught me his own percussive/mathematical formula. I went through school bands and semi-professional bands, such as 'Street Choir' and 'GPO'. Driving through 3 feet of snow to a small mining village for a New Year's Eve gig in a Working Men's Club. Stopping at a motorway service station or a curry house in Bradford on the way home." This involved playing as much as 7-8 performances a week (Sunday afternoons and evenings) as well as having a full-time job as a plumber's apprentice.